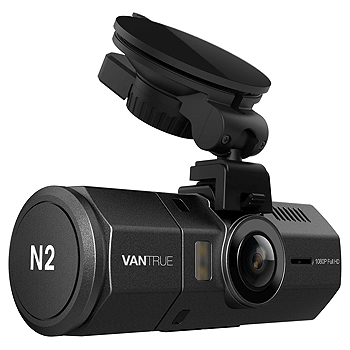 Vantrue N2 is a 1080 pixel full HD dual channel dashboard camera that contains 2 cameras in one single dashcam body – the front facing camera helps you record the view in front of your car while the back facing camera records the view inside the vehicle. This makes it extremely useful for professional drivers like Uber, Lyft and taxi operators (read our Uber, Lyft & Taxi Dash Cam Guide). In dual recording mode, the front camera records videos at a resolution of 1440×1080 pixels @30 fps while the back camera records at a resolution of 1280×720 pixels @ 30fps. Alternatively, you can also choose to shut off the dual camera mode and use the front camera only in which case it records sharper and clearer videos of 1920×1080 pixels @ 30fps. N2 dash cam is equipped with High Dynamic Range (HDR) technology and both the lenses in the unit are wide angle lenses. The front camera has a viewing angle of 170 degrees and the back one has a viewing angle of 140 degrees. You can rotate the back camera up to 80 degrees up and down, independent of the front camera. Superior night vision for the front camera helps you capture minor details which would otherwise be difficult to see in low light conditions. The rear camera however does not have any such inbuilt technical support; so you will have to turn on your vehicle’s light if you want to record the inside view of your car at night. The display of this car camera unit comprises of 1.5 inch LCD screen. The LCD automatically turns off after some time so you won’t be distracted by the continuous recording going on on your vehicle’s windshield. The recording is done in loops and the unit supports relooping so that the oldest footage is automatically overwritten with the new one as soon as the memory card is filled to capacity. 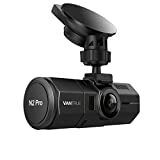 This car DVR supports microSD (read our dash cam memory card buying guide) card of up to 32 GB without any compatibility issues. You can also use a 64 GB card but you will have to first format it to FAT32. Note that there is no memory card included in the package. The manufacturers recommend Samsung Evo 32GB card for best results. 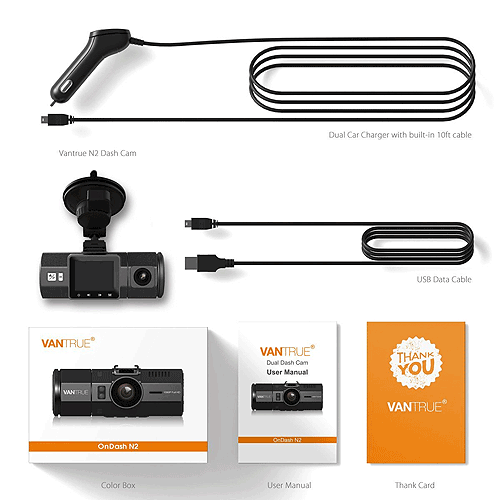 Vantrue N2 dashboard cam turns on and starts recording automatically when your car engine starts. It features an inbuilt G-Sensor to auto save the recording in case of an accident. So, whenever there is any unusual jerk in the vehicle, the G-sensor automatically saves and protects the recorded clip; the clips so saved are locked against overwriting during relooping. You can also lock a file manually. The unit also offers parking security through dual parking modes. 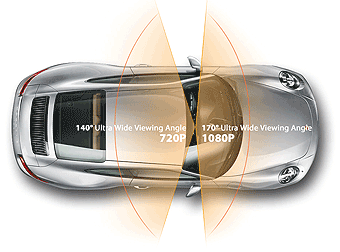 When the vehicle is parked, the camera will automatically come into action whenever something comes closer than 33 feet (or 10m) from front side of the car. Additionally, it keeps taking photos at regular intervals, auto edits the photos taken, and puts them together to make a video clip. However, there are 2 things to note here – first, the parking mode works only for the front camera. And second, you need to provide a power source to the unit since the car ignition would be off when parked; this can be through an external battery kit or by hardwiring the unit to your car battery. N2 dashcam is also equipped with microphone and speaker. Operating temperature ranges from 32 degrees Fahrenheit to 158 degrees Fahrenheit. The GPS module is optional; if you wish to track the speed and driving route, you will have to buy a GPS mount separately. Overall this is a good mid range dash camera for anyone looking to have a dual camera that covers the interior of the car, as well and the front of the car all in one small compact unit. Many of the other Uber, Lyft and taxi friendly cameras are bulky, not as discrete and come with a higher price tag.